Michael McCloud is a Key West original, a 58 year-old guy who makes his living playing music, much of which he has written, in a variety of bars in Key West for the past 35 years. 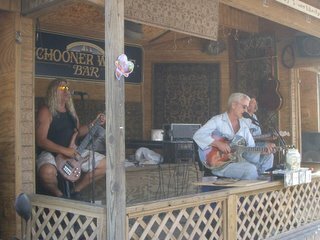 He's been playing 5 days a week at Schooner Wharf for about 11 years now, working for pay, for tips, and what merchandise -- CDs and T-shirts -- he sells. He works alone for two days, backed only by his guitar and a rhythm machine. The other three days, Friday-Sunday, he works with what he calls his partners, Carl Peachey and Bubba Lownotes, both of them among the very best at what they do. I know Michael's repertoire by heart now, can sing along with most of his tunes, and tell his jokes and stories right along with him. Yet, I still enjoy listening to him do what he does, because it's music and it works. The bar has filled up since I got here about an hour ago. I ordered a fish sandwich (mahi, no bread, cole slaw, no fries) and a Michelob Ultra for lunch. Mmm-mmm! I'm going to head back to the Coffee Plantation in a while, but hope to still be here when Bubba comes in. He says he's ready for another Mac session with me, wants to get Garage Band up and running and try to get some music recorded and be able to mix it with some of the backing loops available in GB. He was supposed to call me yesterday or Wednesday, but I haven't heard anything from him. It's his call, I'm ready.